Tudor Days with professional costumed teaching staff. The class can learn about food, medicine, plants, armour, dancing and games, daily life and religion, as well as a tour of the tower. We also have days learning about Stone Age, Bronze Age, Egyptians etc. See web site for full details. OPENING TIMES: Schools are welcome at any time by arrangement. SUGGESTED LENGTH OF VISIT: 4 hours (1000-1400). Free preliminary visit for teacher, teachers. Area under cover for eating lunch. 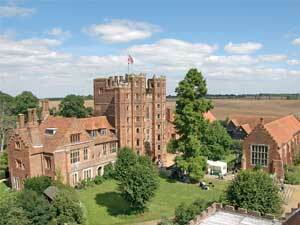 By car: Layer Marney Tower is a 20mns drive from Colchester town centre, off Maldon Road on the way to Tiptree. By Bus: The 75 bus from Colchester Town Centre will take you to Smythe's Green, a 20mn walk from Layer Marney Tower.